'The Garden', at the entrance of Chemotherapy reflects the fact that at an early stage of the design the space enclosed by these walls was to be a courtyard garden. Anna Heinrich and Leon Palmer's trompe d'oeil images show a series of photographic windows and a door into an imaginary walled garden. Chris Tipping also designed decorative vinyls for the Chemotherpy waiting room, each colour-coded to subdivide the waiting area into four sections. The patterns that he used derive from imagery of Rhododendrons and reflect the images used within the design of a large glass screen created by the artist for the old Chemotherapy department and reinstalled in the new building. 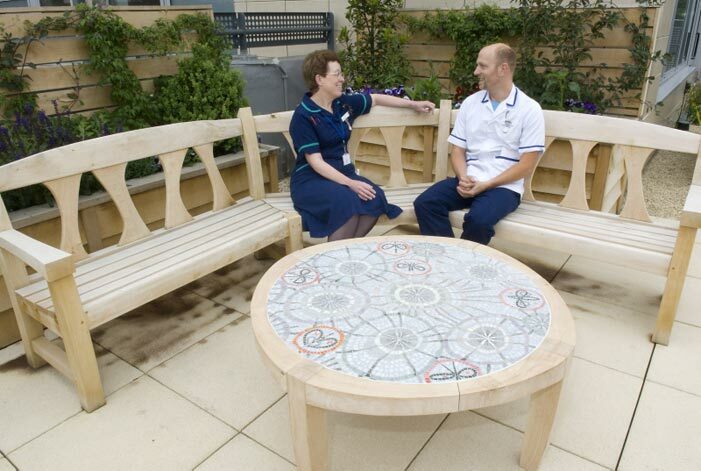 Bespoke furniture by Rodas Designs was commissioned for the Oncology courtyard, including a table inlaid with a delicate butterfly mosaic by Emma Biggs. Designer Ella Doran has created imagery for blinds, screens and prints for four isolation rooms within the ward to create more welcoming and attractive spaces for patients. A panoramic 4m view across South Uist in the Outer Hebrides was commissioned from Heinrich and Palmer for the enjoyment and distraction of those waiting. Photographer Gunilla Treen has created a series of composite photographs to create a calming environment in a treatment area used largely by women. The artwork, entitled Travels in Blue, is intended to prompt memories of walks and travels, and soften the clinical space. A key element of the art programme was to provide high quality art for all single rooms, day rooms, consulting rooms and staff rooms. Over 100 new works were purchased from artists living and working in Oxfordshire and students from Oxford Brookes University and the Ruskin School of Drawing and Fine Art through an extensive open submission selection process by staff. In addition, most of the existing artwork owned by wards transferring to the building was reframed - matching the ash frames of the new artwork - to ensure a consistently high standard of presentation.